The wedding is now just hours away. We've had a wonderful week. Our family has been arriving and we've enjoyed having them near us to help us celebrate! I wanted to thank you for your prayers. It means more than I can say. I decided to show you a sneak peak at the tables and flowers for the wedding. We're all set. We will be up early tomorrow for hair and make up and then off to the church to get dressed. I hope to post some photos tomorrow evening. Thank you for being interested in our wedding and for praying for us. We are so excited and ready! before the wedding this weekend. Tim headed out to work early today so he can leave work early and go pick up his Mom and brother in law at the airport. Our first out of town guests to arrive for the wedding! Lindsay had an eye appointment at 8:00 am, and took Rachel along so she could take her to her cello lesson (thanks to her teacher for doing a 9:15 am lesson today) which is just down the street from our eye doctor. Then they will grab some food and head to pick up Lindsay's wedding gown! She had her final fitting last week. She's beautiful, and the dress looks wonderful on her! This past weekend, I put away the last of the winter decor and brought out my white things and we added in some blue. That was Rachel's idea, and it looks fresh and welcoming. I moved my silver tray and pots to the top of the bookcase and I really like it there. Sometimes just moving things from one room to the next freshens things up. We've entered the home stretch. 5 days to go. Last night Lindsay told me she looked down our row at church and realized that this is the last time she will sit there as an unmarried daughter. She is saying her 'farewells' to her life as it has been, and welcoming it as it will be. I wrote Tim a note in church and said, "I'd like to go out to lunch." We don't do this very often, and it was what I needed. Sarah played with my phone and took this photo and the next one. My sweet girl is growing up. She'll be 12 this year. She's a mixture still of little girl in braids and young lady. I love her so. When my nephew married nearly 8 years ago, his bride thoughtfully made up activity bags for all the young children attending the wedding. Rachel and Sarah were the recipients of two of these and they were happily occupied during the reception. With a lot of kids attending this wedding we opted to do activity bags for children 8 years old and under and we currently have 28 on our list! Wow! I am using simple brown lunch bags cut down in size a bit with a decorative edged scissor. On the front will be each child's name, and the bags will be placed on the table where the child is sitting. I found these great coloring books on Etsy quite by accident and knew it was perfect for us! I ordered a mini size so they would fit into the bags. Wedding things to color, mazes, color by number, things to check off…lots of activities to keep the little folk occupied. These were purchased as a digital download for $4.00 from Sugar Pie Studios. It was easy peasy! Lindsay's bridal shower was last and it was great! It was very well attended and as usual we had has so much fun! The evening started with candlelight for eating and visiting. As you can tell I had to really edit these first three. 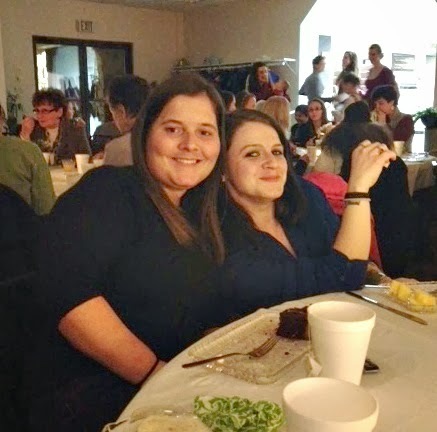 My niece Shelly (Tim's brother's daughter) with Kayleigh. My niece Kaitlin (my brother's daughter) and Rachel. Emily and Emily or Emmie and Emma. Long time friends! We played just one game - design a bridal gown! The ladies were reluctant at first but the younger girls got into it right away! They all ended up have fun. We let Sarah hand Lindsay the gifts to open, which just thrilled her heart! This little lady is Molly. She is a special friend of Lindsay's and is the flower girl for the wedding. Thank you friends for you gifts of love to help Lindsay and Joseph set up their house. She was so thrilled and happy last night. My dear friend Tracy commented on my last post that, "you aren't talking at all about what it's going to be like without Lindsay there each day." She's right. I haven't. It's not that I am so sad and not wanting to face reality, I guess it is because in so many ways life will go on as usual. School with the younger kids, watching Kamryn, cello lessons, piano lessons, meals to cook. But there will be a place without my firstborn girl in it. She will be happily married and keeping a home of her own. She is going to be working part time for awhile as well, and so we know that even though she is only 10 minutes away, we will likely only see them on Sundays, at least for a while. One of the hardest things to do at 12 days before the wedding is to get the bride and groom to focus on the details they are responsible for. Like their playlist for the reception, vows, and the wedding covenant they want to sign during the ceremony. Sigh. 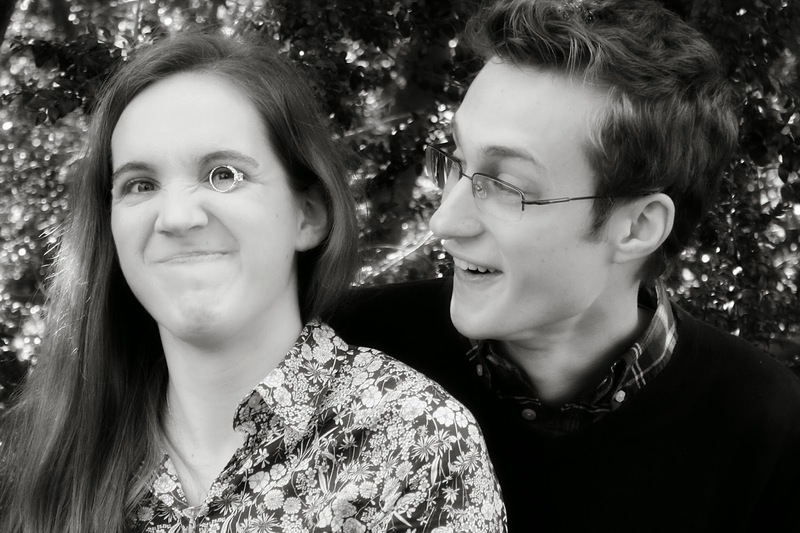 I totally get that they are just ready to be married - all the rest of this is formality. But alas it is important formality so it must be done! The brides family and the grooms family now have all their attire for the wedding! That is huge when you consider that we have 10 people, and they have 15! We are waiting for baby Ben's bow tie to come. We ordered from an Etsy store. It's hard to find baby sized bow ties in the right color! You all know that I am a tea lover and that in my inherited, but not valuable, china hutch I house most of my tea things. I've been wanting to freshen up the interior of the hutch for quite sometime, and since I had quite a bit of Annie Sloan Chalk Paint left, I decided to take the plunge and just do it! 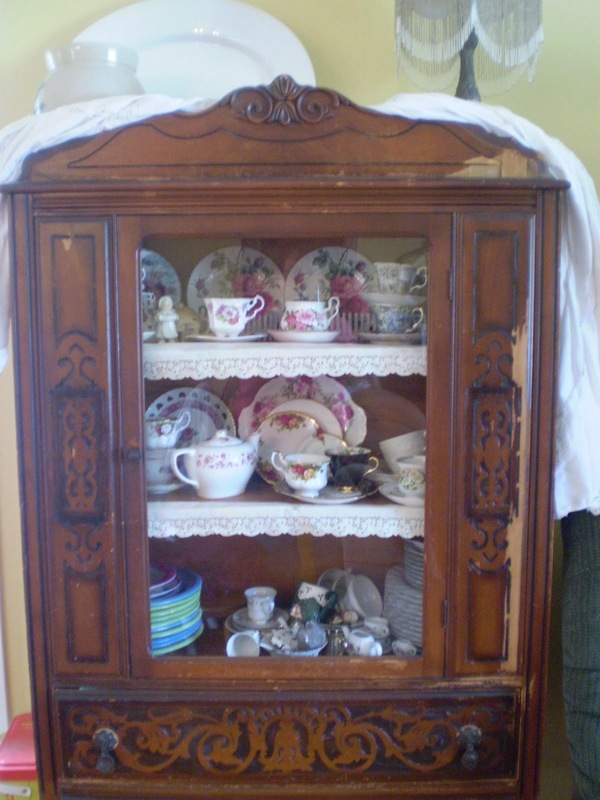 Here is what my hutch looked like in 2007 before I painted it. It had water damage and so I used to drape that fabric and cover it up. I painted it white and have loved it ever since! The interior was painted a light green and it looked pretty with my tea things. Seven years later it is looking pretty beat up and I was no longer loving the green. Here is the beginning of adding the Annie Sloan "Emperor's Silk." It is lighter here than it looks in person. Here is the finished look, and the red is more true to color. As you can see my collection of teacups and teapots has grown since 2007. I'm a happy girl! Are You Ever Really Prepared?